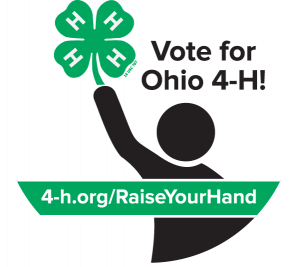 Vote for Ohio 4-H! We need you. Youth, supporters of 4-H, alumni, volunteers, stakeholders, anyone can vote. Please help us win! If Ohio wins, the money is split between the counties. Please share with anyone you know. 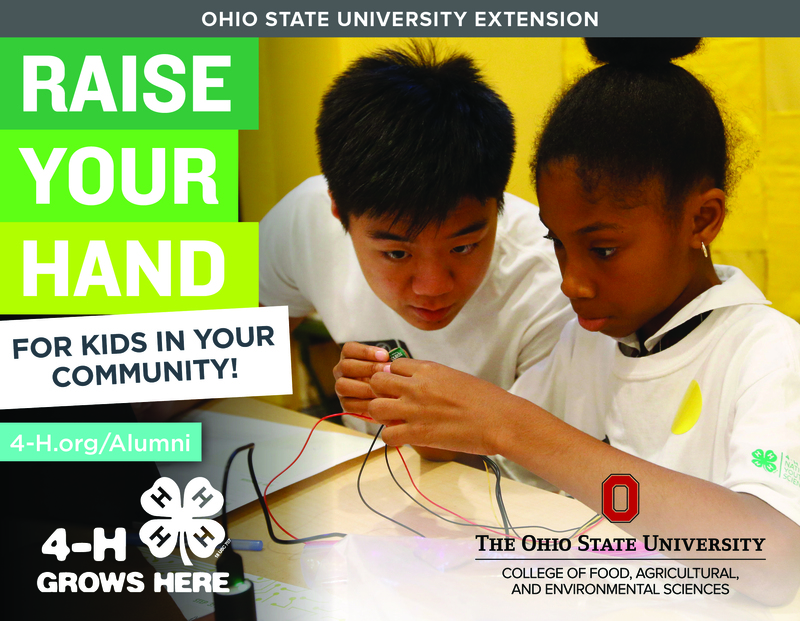 Raise your hand for Ohio 4-H. All alumni, members, volunteers, friends, supporters, anyone can do so by May 15. Please click the link below, enter your information, and SHARE with all you know! Ohio has won this the last 2 years so let’s make it 3 years in a row. The counties will split the money raised if we win. Help Greene County and Ohio win! 4-H Council’s Raise Your Hand competition. Ohio raised nearly 18,000 hands through online voting. up were Nebraska 4-H (14,115) in second place and Kansas 4-H (10,020) in third place. 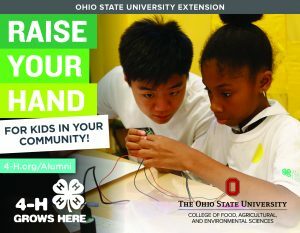 Ohio 4-H is the statewide youth development program of The Ohio State University’s College of Food, Agricultural, and Environmental Sciences (CFAES). “I’ve said that the lyrics of ‘Carmen Ohio,’ the alma mater of The Ohio State University, truly live within our community of the College of Food, Agricultural, and Environmental Sciences. ‘Time and change will surely show, how firm thy friendship’ applies to our 4-H alumni and supporters as well,” said Cathann A. Kress, Ohio State’s vice president for agricultural administration and dean of CFAES. Ohio’s 2018 total “hands raised” eclipsed last year’s winning tally of 11,811 votes. Unlike last year, when Ohio led gate to wire, the Buckeyes found themselves neck and neck with Nebraska 4-H. Leading up to the last week of the 2018 contest, Nebraska had been ahead by 83 votes. In come-from-behind fashion, the Buckeyes doubled their hands raised in the last week to secure the $20,000 for hands-on learning experiences. 4-H, the largest youth development program in the nation, called on alumni and friends to raise their hands to help bring 4-H to 10 million youth by 2025. Currently, 4-H empowers nearly 6 million young people in every county across America, including 156,000 4-Hers in Ohio. Raise Your Hand for Ohio Youth! Calling all alumni, volunteers, youth, students, parents, supporters, stakeholders…we need you! 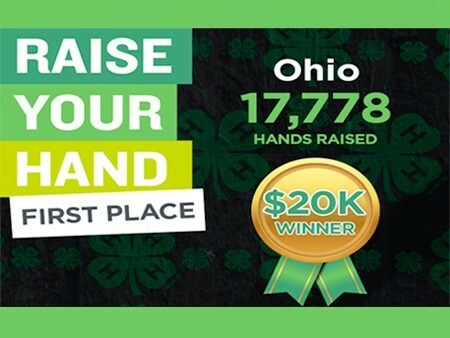 The state with the most hands raised will win $20,000 for their local 4-H programs. 4-H gives youth the opportunity to learn by doing, grow from failure and develop the skills they need to handle what life throws their way. 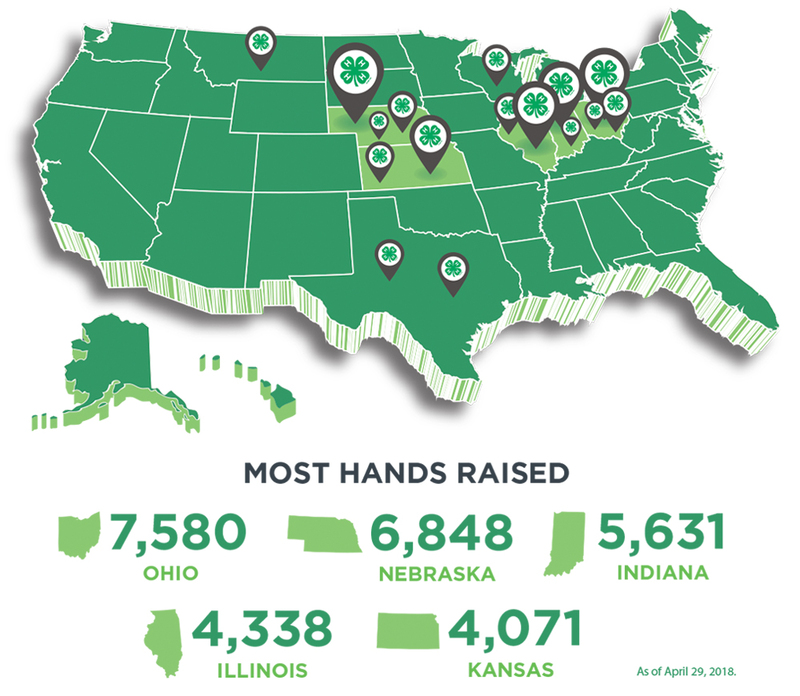 Starting today, we’re asking you, friends of 4-H, to Raise Your Hand to support 4-H’ers in Ohio. Each hand raised is a vote towards a $20,000, $10,000 or $5,000 award for the three states with the most hands raised. Help bring the high-quality 4-H experience to even more youth right here in Ohio. 1. 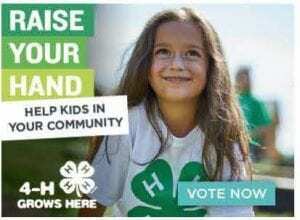 Raise Your Hand: Go to 4-H.org/RaiseYourHand to vote for your state. 2. Compete for Your State: Raising your hand is a vote towards a $20,000, $10,000 or $5,000 award for the states with the most hands raised. Thank you for your support and don’t forget to Raise Your Hand by May 15th! The Raise Your Hand campaign has just kicked off again. We are asking all 4-H alumni & friends to raise their hand by voting for Ohio. The state with the most hands raised wins $20,000 for youth programming. We won last year, and we are determined to win again this year! Please help by raising your hand and asking friends and family to do the same.